I went insane when I saw that Soap & Glory makeup was available in Ulta. Their bath and skincare products used to be at Target, but then went away for years. I got a couple of things from them, but the one I immediately used was Peach Party. 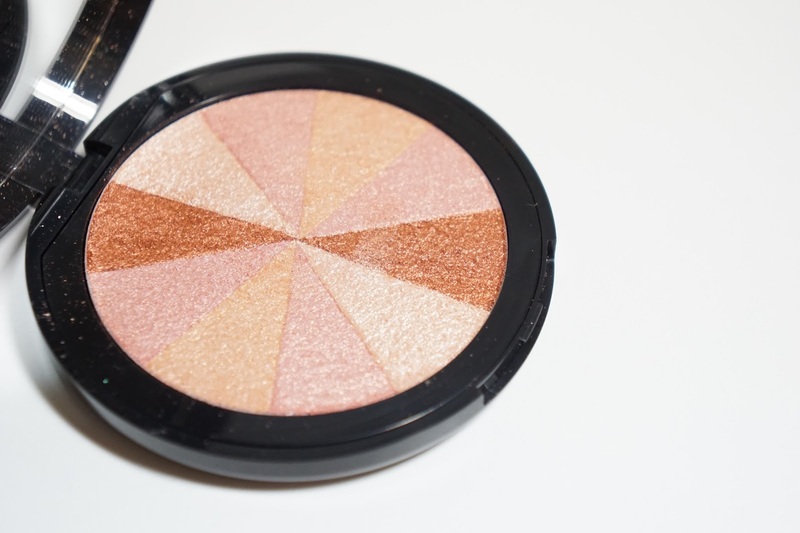 It is a "Multi-Colour Blush Brick" that contains peach, gold, copper, and pink shades to create a beautiful bronzey peachy glow on the cheeks. Peach Party contains 7.5 grams / 0.26 ounces of product and retails for $15. Peach Party is called a blush by Soap & Glory, but it's so shimmery that I would only use it as a highlighter on my medium skin tone. 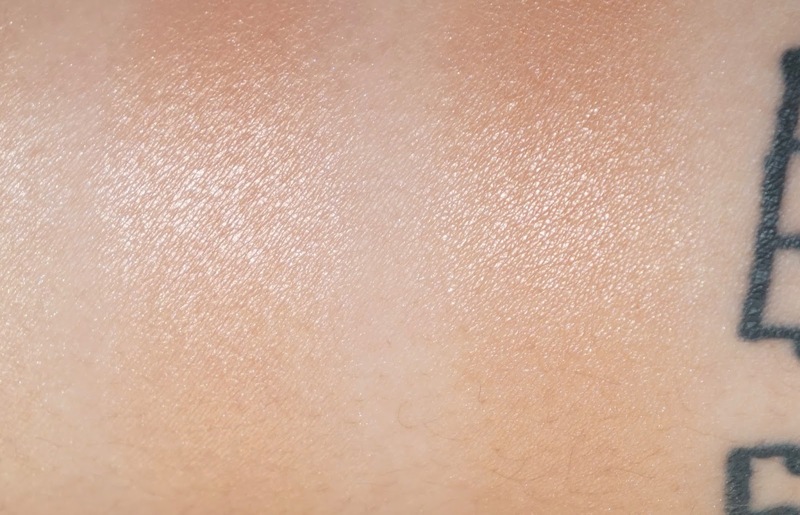 If you're more fair than I am, the color instead of shimmer would probably be more apparent and look like a beautiful highlighting blush. 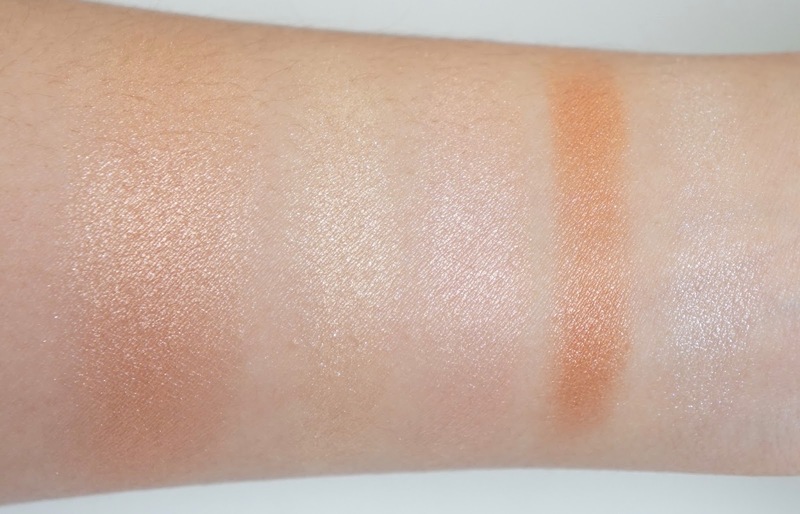 The left swatch is all four shades mixed together and the other four are the individual shades. If you use a smaller brush, you could probably shift the overall color to be lighter, darker, or a different shade. You could also use a small eyeshadow brush to apply these shades on your eyes. I use the ELF Complexion Brush to apply Peach Party and it gives me the perfect amount of color and glow. I was using my OttLite to take these pictures and you can see how Peach Party just catches the light when I turn my face. I originally thought this was just a highlighter and I was confused on why it was so pigmented. The powder is also pretty soft and slightly powdery, but it made a lot more sense when I realized it was actually advertised as a blush. Peach Party lasts a pretty long time on my skin and the shimmers also don't transfer to other parts of my face. For a drugstore product, I'm really impressed. 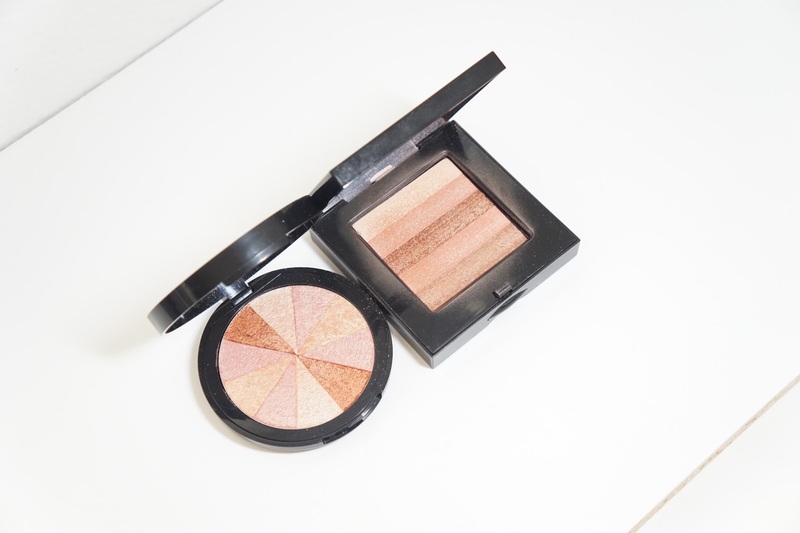 While using Peach Party, I noticed how similar it was to the Bobbi Brown Shimmer Brick Compact in Sunset Pink. The individual colors aren't the same, but they look pretty similar when blended together. The finish is similar and both are really easy to go overboard with. Both Peach Party and Sunset Pink can go pretty metallic if you use too much of it. I personally don't like that look and so that's why I use a fluffier brush instead of smaller tapered brush that you sometimes see used with highlighters. Final thoughts: I LOVE Peach Party! It's a bit overwhelming as a blush but it's perfect as a highlighter! A lot of peachy highlighters look more yellowy on me but this one has some pinky bronzey tones to it that works way better. I also like that it's a more affordable dupe of the Bobbi Brown Shimmer Brick in Sunset Pink, which has been discontinued. The only two downsides is that it can be a bit powdery and it can look metallic if you really go crazy with it. Besides that, the color is beautiful and it lasts a really long time. I look illuminated but my pores aren't emphasized and my skin doesn't look oily. This highlighter blush is pretty intense and so I wouldn't get it if you regularly do a natural or no-makeup makeup look. 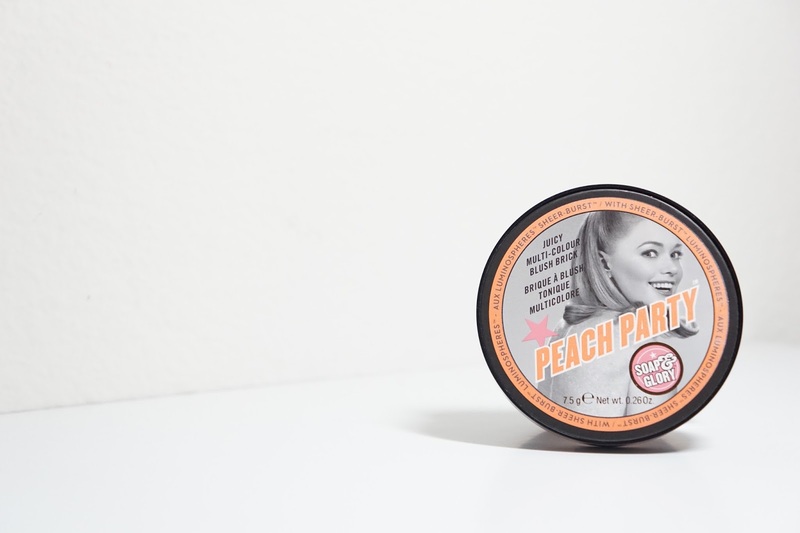 Have you tried Peach Party? What other Soap & Glory products do you recommend?